2nd Swing Golf has partnered with the DriveHard fundraising project in an ongoing effort to help fight Alzheimer’s disease. DriveHard has a primary focus of engaging the golf community, through the sale of golf wristbands, in order to raise awareness and funds for Cure Alzheimer’s Fund. Through its industry partnerships within the golfing communities in the United States, Canada and beyond, the DriveHard Campaign is working to become a globally recognized symbol in the fight against Alzheimer’s. The campaign is striving for a future where everyone can remember his or her past. Did you know that as many as 5.3 million people in the United Sates and 500,000 Canadians are living with Alzheimer’s? These numbers continue to grow, and we need to fight for a cure. Alzheimer’s and dementia triple healthcare costs for Americans age 65 and older; the direct and indirect costs of Alzheimer’s and other forms of dementia to Medicare, Medicaid and businesses amount to more than $148 billion each year. These are just a few of the facts we currently face with this debilitating disease. You can help this cause by showing your support for the DriveHard campaign and for the ongoing battle to conquer Alzheimer’s by wearing a DriveHard golf wristband. 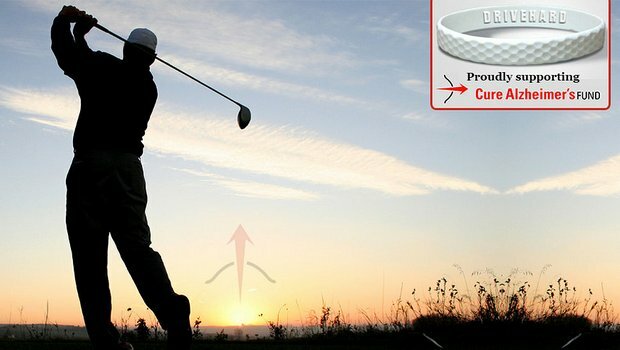 The dimpled wristband design replicates the dimples found on a golf ball; it’s not only a stylish design, but wearing one will go a long way towards creating the much needed funds and awareness for Alzheimer’s. DriveHard wristbands are available for purchase through the DriveHard website (www.drivehard.org) or from golf courses and retail locations throughout the United States and Canada. Funds raised through the sale of the wristbands go directly towards the research and development being conducted by Cure Alzheimer’s Fund. Cure Alzheimer’s Fund is a 501(c)(3) public charity. The goal of the Cure Alzheimer’s Fund is to stop the disease before it even strikes, with early prediction and prevention. Since 2005, the charity has discovered 120 other genes that are linked with Alzheimer’s and make up the other 70 percent of those at risk. But more importantly, identifying these genes is the first step to understanding the cause of the disease before a cure can be found. Research is the only path to progress. For the past five years, the Cure Alzheimer’s Fund has focused some of the best scientific minds in the industry on fighting this disease. Their researchers are focused on cutting-edge work that is making progress in the search for a cure. They are tackling the biggest issues in Alzheimer’s disease at renowned institutions across the United States and abroad. More information about Cure Alzheimer’s Fund can be found online at http://www.curealz.org. DriveHard is a fundraising project aimed at engaging the golf industry while raising awareness and funds for Alzheimer’s. This is being done through the sales and distribution of their DriveHard golf wristbands. More information about DriveHard can be found online at http://www.DriveHard.org.